Lions prep for Giants with Odell Beckham Jr. If Beckham's sprained left ankle keeps him out of a second straight game, the Lions have other plans. 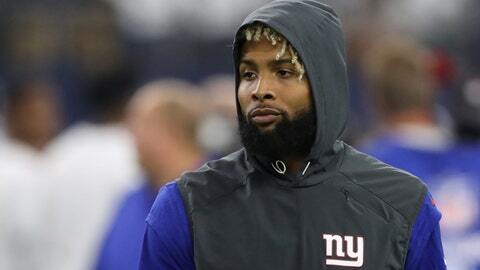 EAST RUTHERFORD, N.J. (AP) — Detroit Lions coach Jim Caldwell isn’t wasting time worrying whether Odell Beckham Jr. will play for the New York Giants. When Caldwell drew up his game plan for Monday night’s contest between the Lions (1-0) and Giants (0-1) at MetLife Stadium, there was a section for dealing with the catalyst of the Giants’ offense. If Beckham’s sprained left ankle keeps him out of a second straight game, the Lions have other plans. Heading into the game, it looks like Beckham will play. The three-time Pro Bowler practiced on a limited basis this week for the first time since hurting his ankle in a preseason game on Aug. 21. He moved well in the parts of practice that the media were able to watch, and Friday he caught some passes and made cuts in a red-zone drill. He was listed as questionable in Saturday’s final injury report. His status for the game will be determined in warmups Monday night. The Giants did very little on offense without Beckham last week, gaining 233 yards in a 19-3 loss to the Cowboys. Quin said there was no doubt that Beckham would pass up the chance to play in a home opener in prime time. Most teams that have faced the Giants in the past two seasons have employed a two-deep formation with their safeties. The Cowboys did it and Eli Manning never had a chance to go deep because his woeful offensive line never provided time to throw, and the running game was limited to 35 yards on 12 carries. If an offense runs the ball effectively, the two-deep formation can be exploited. The Lions’ offense was in midseason form in its 35-23 win over the Arizona Cardinals. Matthew Stafford threw for 292 yards and four touchdowns in engineering yet another fourth-quarter or overtime comeback. He did it an NFL-record eight times last season and he now has 27 winning drives in the fourth quarter or OT since 2011, most in the league. Stafford, the league’s highest-paid player, faced the Giants here in December. Playing with an injured middle finger on his throwing hand, he threw for 273 yards in a 17-6 loss.